When it comes to makeup I usually go minimal. Well not because I like it that way but because I am not at all an expert at it. It's like I am a kidergarten student when it comes to makeup. Trust me if I could do good makeup you would never see me without it. I believe makeup is an art and it takes a lot of talent to be a good makeup artist. Makeup done properly can do wonders and I have huge respect for everyone who can do it well because I know how difficult it is to do the perfect wing or the best contours. If you see my YouTube account I'm subscribed to every good makeup channel possible. And at least I am thankful I have learnt to do the basic. But from now on I am going to learn more and try to get better. Anyway coming back to the topic, I purchased few products from nyakaa.com . 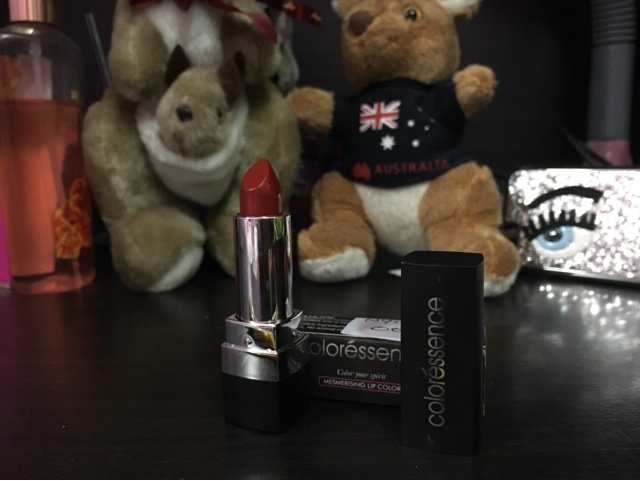 This is the first time I shopped from the website and also the first time shopped makeup online. I maybe a sucker for online shopping when it comes to clothes, but when it comes to makeup you have to keep few things in mind. The color of the product may not be how you see it on screen. 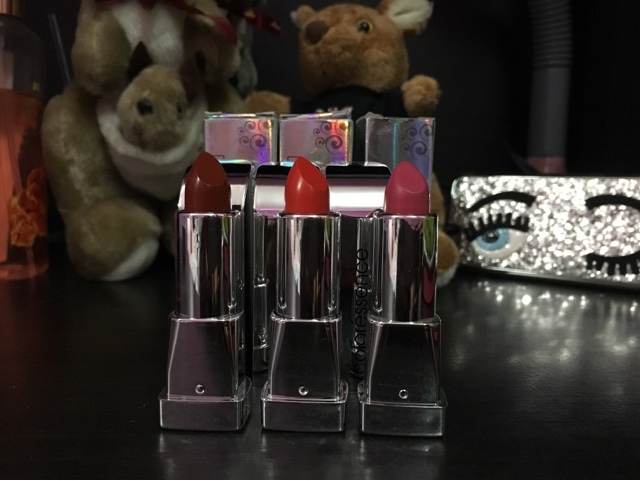 The texture might be different (specially for lipsticks). And most importantly if it's going to be genuine at all because your skin is involved. 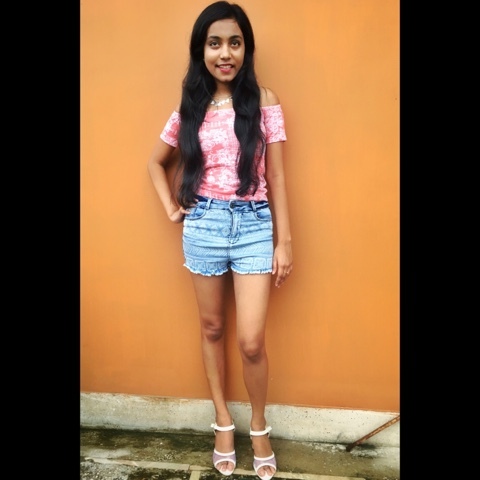 But I have read some really good reviews about nykaa.com so I just wanted to give it a try. Nykaa is an online store for beauty, skincare and haircare products. It has over 400 brands and over 40000 products. It delivers all across India. It is very pretty and well organized with good navigation. You won't face any difficulties with finding the product you want. Very simple. Choose the product. Add it to cart. Give your delivery details. Choose a payment method and place your order. You can use coupon codes for discounts (I'll put a code at the end of the post). There's an option for COD for orders over Rs. 500 and free shipping too. Well I am kind of disappointed with the time it takes. But maybe it varies from city to city. It was written delivery within 2-3 working days. I placed my order on 18th August. There were 9 items. I received one on 24th and the rest on 29th of August. 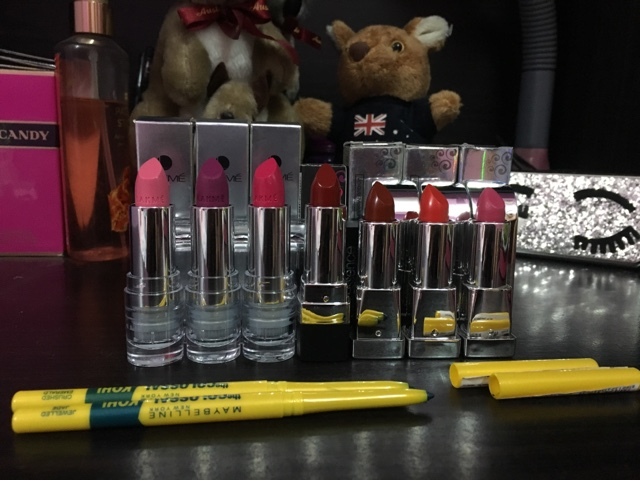 The packaging was good and the products were in perfect condition without any damage. Well arranged and packed. I order 7 lipsticks and 2 kohls. Well I wanted to be on the safer side. The three coloressece primea products I order i.e. Red alert, Bomb shell and Bamboo pink, I have been using these since forever. I was not sure if I would buy them but the shopkeeper insisted and since then they have become a necessity. The shades perfectly suit me. This is the 3rd 4th time I am buying them. Not because I have used them way too much but because I keep losing my lipsticks. 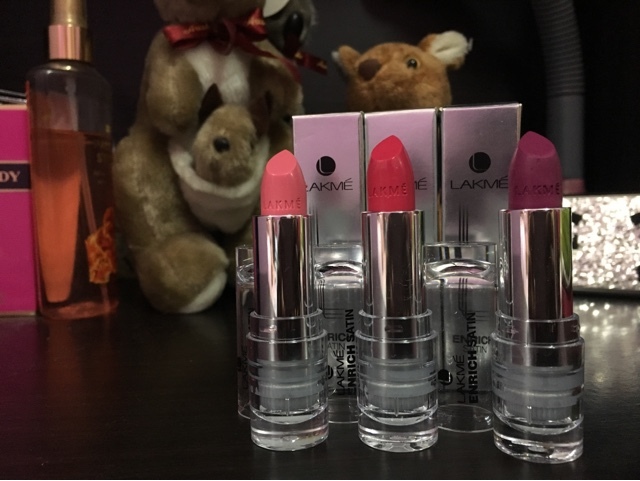 The other three lipsticks I got from Lakmé enrich satin are because I loved the shades. Specially the purple one. It's exactly the same shade Priyanka Chopra wears in Quantico and her lips just look amazing. And the last one is the regular coloressence in the shade fire desire. And lastly two colossal kajals in crushed emerald and jewelled jade. 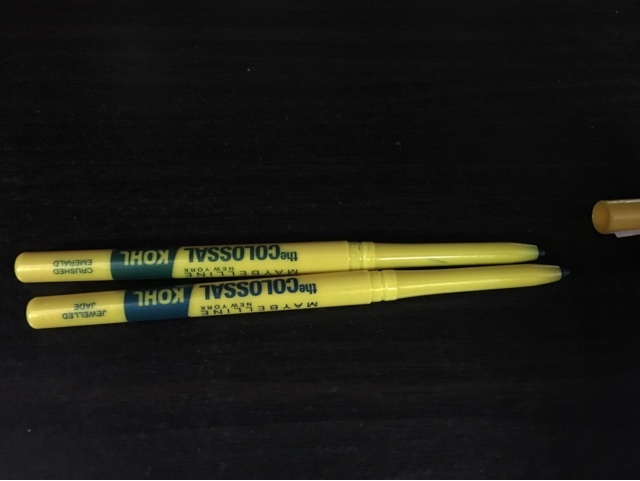 All the products were exactly the same and they are 100% genuine. 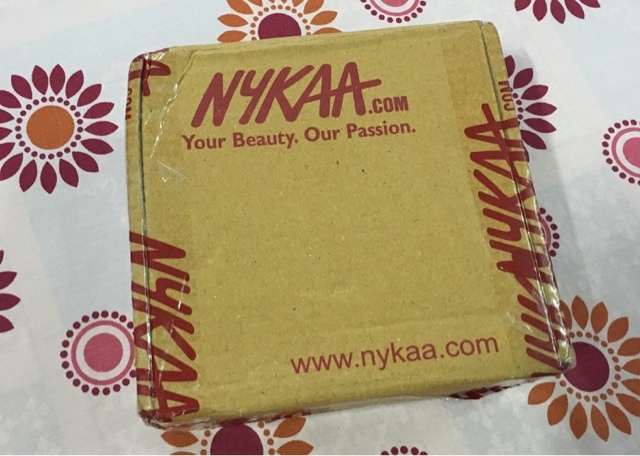 Will I shop from Nykaa again? 2016 is officially the year for OTS and you have no idea how much I am obsessed with the trend. I wanted to know more about Bardots so I googled and found out Bardot dresses are named after the French actress Brigitte Bardot who was first spotted wearing this style in the 1960s. I am so thankful to the designers who brought this style back. This is a great way to flaunt any body type. Everyone can pull off this style. 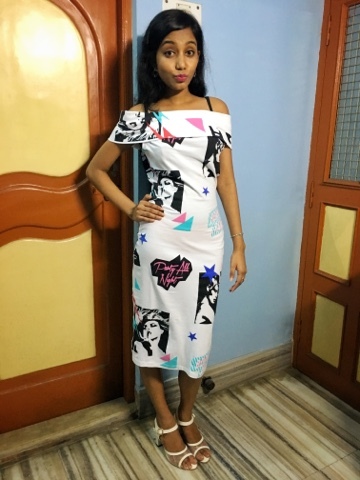 So coming to my outfit, I bought this Bardot dress long time back but I wanted to wear it for a special occasion. Since I was too busy with my college and studies (LOL kidding😂) I had to keep it aside for a while. I thought maybe on my birthday. 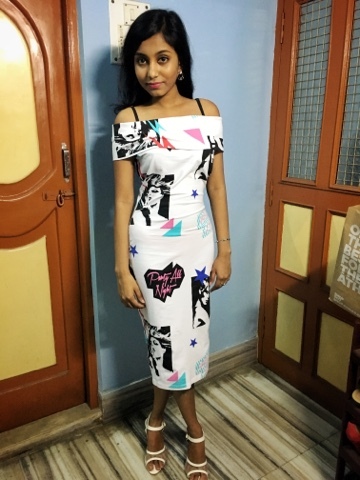 But as soon as I got the invitation for the bloggers meet I decided I am going to wear it. (Read about my experience here). This dress is absolute love. 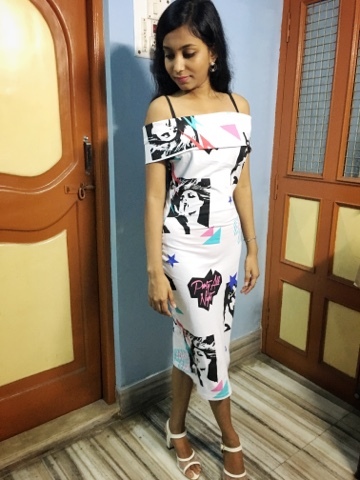 First of all it's a Bardot, second, the quirky print and finally the amazing midi length. So casual yet so stylish. I love body cons as they look great on my body type. So another plus point. I paired it up with my favourite pair of white block heels. Can't really get enough of them. So comfortable and classy (My obsession with the net detailing continues). And I opted for minimal accessorising. I wore my kangaroo bracelet. If you follow me on snapchat you know about my love for Kangaroos and they are my lucky charm too. I wore a simple pair of earrings to complete the look. This post is going to be on my first experience at a bloggers meet. I am going to write all about the meet in a different post. I don't want to join them together because The brand had amazing things to discuss and share with us and it deserves it's own place on the blog. 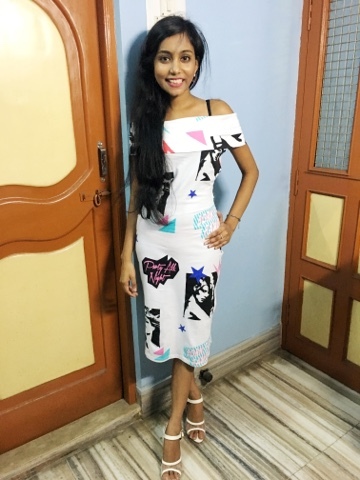 Last week when I got an invitation to attend a Fashion Bloggers Meet conducted by the online fashion store www.sassystripes.com I got really happy. This was the first time I was invited for any kind of bloggers meet and I knew I had to attend. I believe it's very important for bloggers to meet like minded people and share ideas. It helps in the growth, personal as well as professional. It's a great way to let people know about your blog. Whoever loves fashion, loves creativity. Therefore when it comes to fashion, mainstream is just what people want to avoid. If you are not experimenting you are not learning. So I want to try every kind of fashion because I believe the way we present ourselves has a lot to do with the clothes we are wearing. And I have noticed when I try a different style, it brings out a different personality in me. I feel like I am a part of everything. So even if I go wrong at times, I love buying different kind of clothings and experiment. 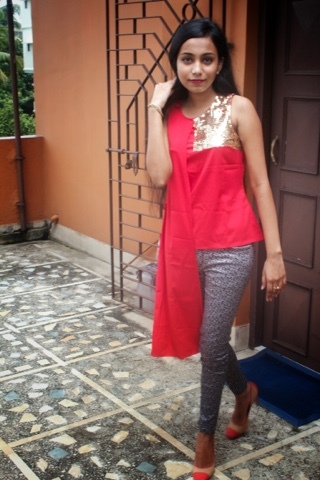 I personally love this red asymmetrical top with sequin work in front. It is so simple yet so chic. You can wear it with almost any dark coloured bottom. I wore a black and white printed trouser with it. But a pair of shorts or denim skirt would go well too. 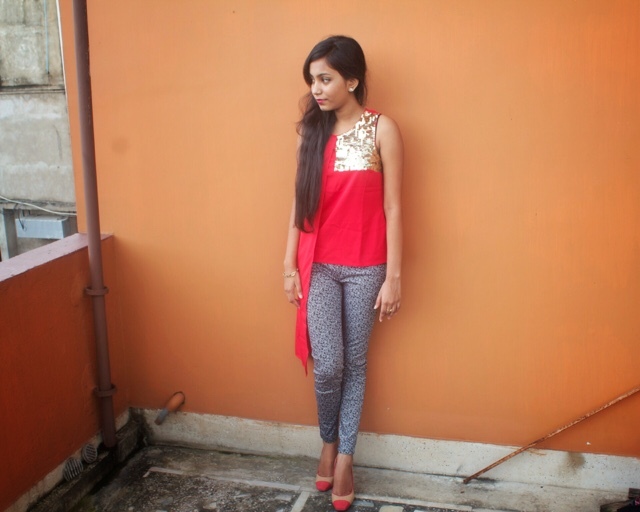 I wore this beige and coral heels and accessorised a bit with just a golden bracelet. This outfit is perfect for clubbing with your friends. And before you think I am going to write "even though I wore it at home", let me tell you this time I actually went out for a birthday party. "All my life I thought of love as some kind of voluntary enslavement. Well that's a lie. Freedom only exists when love is present. The person who feels freest, is the person who loves most wholeheartedly." When I read the book 'Eleven minutes' by Paulo Coelho for the first time, I was too young to understand the depth this book deals with. However, there were certain parts, lines, messages in the book which had been permanently engraved in my heart and this line is one of them. The ultimate truth has been spoken. He couldn't have been more correct. "Hey there", Says a very excited and happy Sumelika. So finally I bought a domain name for my blog. yayyy😁. It was a sudden decision. I always had this on my mind that someday I am going to buy a domain name for my blog but I wanted to wait for at least one year. I thought maybe I'll gift the domain on my blog's first birthday but last evening when I was browsing through my blog I realised how much it means to me. This is something,no matter how small it maybe, that is totally mine. Probably the first thing which I have done completely on my own (my parents don't even know I write a blog...or write at all). So even though I knew there are many complications and problems that I have to face if I am changing a blog into a website which includes investing money, without a second thought I pressed the confirm button. I was going through a rough patch in my life last year. I was completely lost. You know the things happen when you become an adult and join college, meet new people, lose control over yourself, fall in love with wrong people, well something like that. I couldn't figure out anything and one after the other I made many wrong decisions. Well let's say I was in a toxic relationship. There were several occasions when I wanted to kill myself. I had always been a cheerful person. You would always spot me with a big bright smile on my face (My stupid pictures on the blog with all-teeth-out smile is the proof...c'mon at least I am learning to pose now huh). So yeah trying to kill myself meant something was seriously wrong with me. I was always fond of traveling. And I believe it's in my genes. My parents love traveling like anything. Both of them understand it's importance so I have been really blessed and I started with my travel tales right after I was born. We used to travel very often until I joined college. Things literally changed. We went to Thailand for the new year that's all. First year at medical school was hectic. There were so many times I wanted to give up and run away. I kept on shopping to feel good but after a certain point of time even shopping didn't help. And my relationship was another burden for me. I don't remember a single day I didn't cry. But I was too weak to let it go. Luckily my exams were good and I cleared my first year. So my dad surprised us with 4 tickets to Australia. And that trip completely changed me. It cleared my head, made me positive and I was strong once again. I learnt to let go off the toxicity. After a long time I felt like I know what I want. 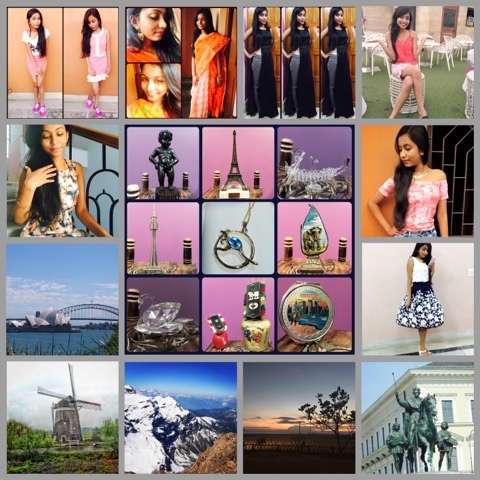 Travel has always been my second love (First being Shah Rukh Khan), there has always been this passion in me when I am talking about foreign lands, their cultures and people. And I used to read different blogs a lot, so much that I wouldn't stop until my phone's battery die. I was so inspired I someday wanted to write my own blog. Even though I am not an expert at writing, I wanted to express myself and there was no better way (Writing my diary has always been my favourite part of day). But I didn't know how to start. So I exactly did what I am supposed to do after I came back. I did a lot of research and finally in the month of December I wrote my first post. It was a lot of work initially. Everything was new and difficult. It required a lot of time and effort. I was not even sure about the name of the blog. I have always been in the habit of writing a diary. Writing a blog was similar, only difference was it won't be a secret anymore once I write here. I wrote the second post a week later. I didn't tell anyone about my blog. I was too scared and embarrassed. Nobody really knew the writer side of Sumelika. What if I end up looking like an idiot. I kind of gave up. This time we were going to Sri Lanka for New Year's. And I remember crying alone in the terrace of the hotel watching the fireworks in the sky while everyone was busy partying away the last evening of the year. I recalled the last new year and how things have completely changed this year. Hearts, promises, everything was broken. I recalled everything I went through the whole year, the year which had been a roller coaster ride, the year that broke me down to pieces, the year that completely changed me. But for the better. There was this sort of loneliness but soon I realised I am on my own now which means I am stronger than ever and free. And I promised myself everyday I spend this year is going to be better than the same day last year. I am going to replace all bad memories with good ones and good memories with even better ones. And most importantly I am going to follow my dreams and never give up and I joined the party soon. So as soon as I came back I continued with my blog and I shared my third post on Facebook. I was not scared of being judged anymore. Being a technologically handicapped person I didn't even know what SEO meant but I worked really hard and leant whatever I could to make my blog better. Even though I know very little about the technical parts but how much I know I learnt on my own and I am proud of that. As time went by this blog became lot more important to me. Writing here would be a stress buster, a source of happiness. 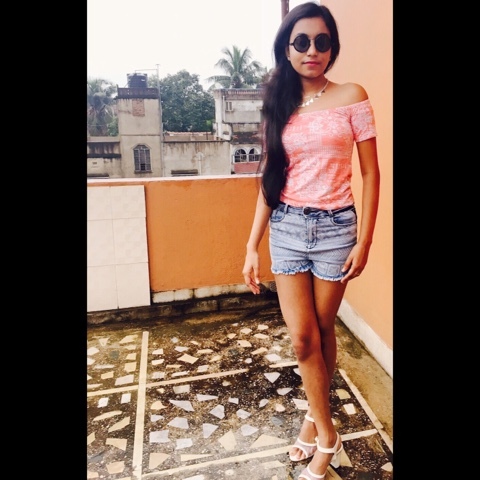 So I decided to add other components too that I love and that's how I started with my fashion posts. 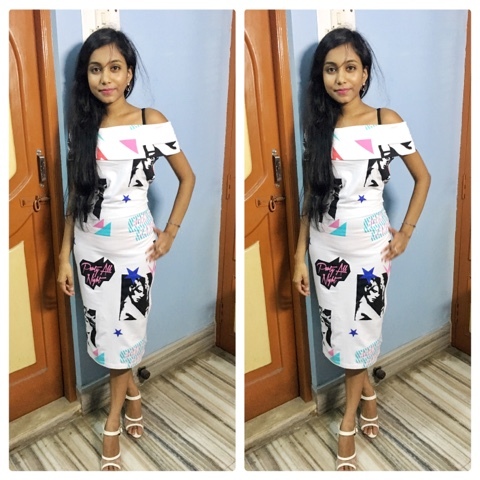 I love dressing up just like any other girl and I would get a lot of compliments for my outfits so I decided to share my thoughts on fashion. I won't deny there have been various occasions when I was lost and didn't know what to do with my blog..(or my life) but deep inside I knew I would never give up on this. And this is the reason I started writing inspirational stuff. Maybe I write them here for others to read but frankly speaking I also write them for me. So that I can inspire myself when I am low. I genuinely believe that there is no bigger inspiration for us than ourselves. We can learn the best only from our own experiences. Maybe this is just another blog for others but every time I look at my blog I see my strength. I see myself as a person who has come a long way and is a much better and happier person now. And even if I don't have thousands of readers everyday, I feel so happy even when I see 10 people reading my posts. Specially the times when I wouldn't write for days and I would still see so many page views everyday. It feels great when someone is appreciating something that means so much to you. So with the new domain I promise to work even harder for this. (Well I have to since I have to re-register my new address with so many websites.) I lost my alexa rank too which was pretty good. But it's okay. I'll make sure things only get better from now on. I know this post was too much personal and long too (Although I tried to make it as short as possible). So if you read till the end, thank you so much. I know it sounds cliche but a huge thanks to everyone who has been with me all along the journey till now. 2016 is officially the year for off shoulder outfits. 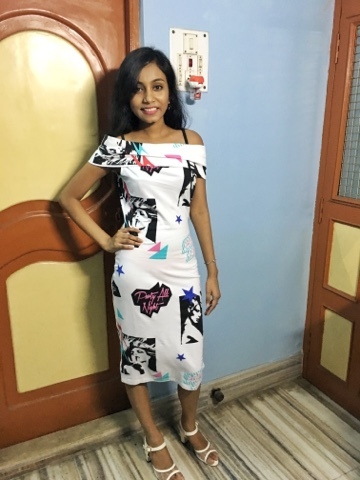 Be it a top or a dress or rompers and jumpsuits,you can never go wrong with giving the cold shoulder 😃. There are so many ways to wear off shoulder outfits. And no matter what way you go for you are going to look absolutely stunning. 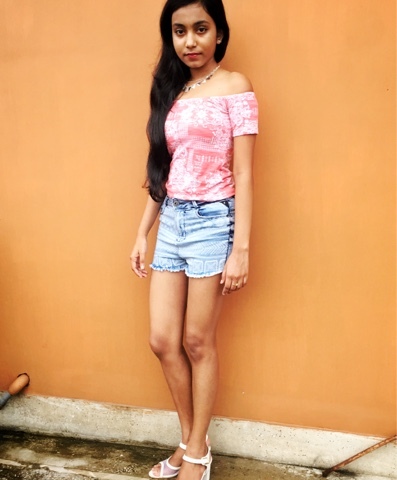 So for a start, I wore this very simple coral off the shoulder top and paired it up with this super awesome denim shorts which is definitely my favorite. 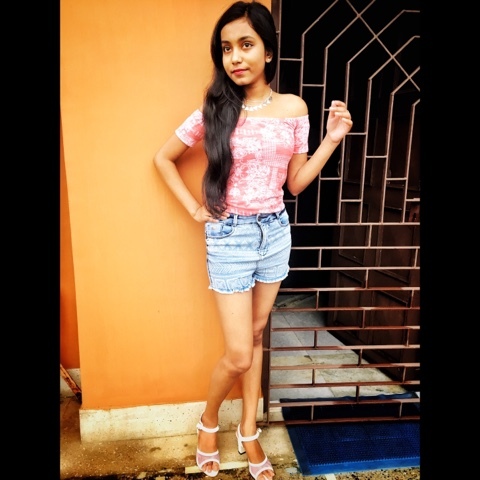 This top if you remember is the one I bought from StalkBuyLove. Well as I said in my review (click here) I had sizing issues and I was worried about their return and exchange policy. But even though they took some time they finally exchanged it and tadaa I can wear it now. 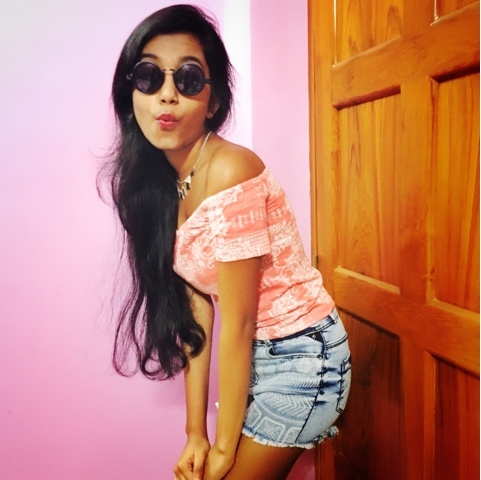 These shorts, well I believe a pair of denim shorts are a must for every wardrobe. You can practically style them with anything and everything. And I very well know I am going to wear these a lot. I wore a pair of white block heels with net detailing in front. They are super comfortable and yet so stylish. And finally accessorized with a silver neckpiece and a pair of black shades. Even though I feel a black choker would have looked better but currently I don't have any. (Note to self: Buy a black choker). Aren't these words so honest? 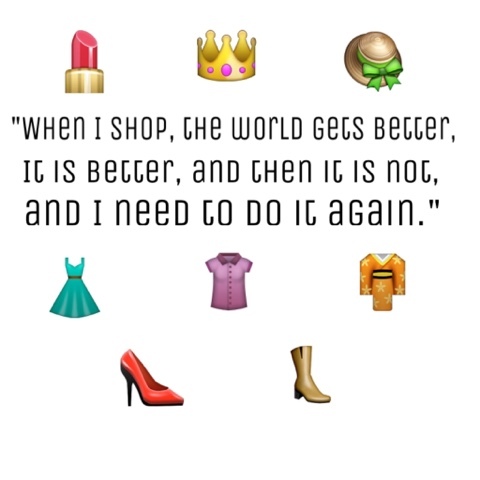 The shopaholic series is the one book that perfectly describes the feelings and emotions we shopaholics go through and some way or the other we all can relate to Becky. If you follow my blog, you very well know how much I love shopping. In fact, I love shopping more than most of the things. Shopping makes me happy in a way nothing else can. 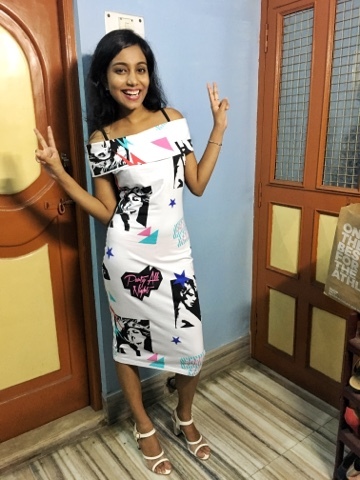 So I am going to share with you how it is like to be a crazy shopaholic and if you are one, you are surely going to relate. 1. You might be very calculative when you are spending your money but when it comes to shopping you spend the last penny in your pocket without giving it a second thought. Because shopping is something you do with your heart and not brain. Duh!!! 2. You never have enough room in the wardrobe to keep your new clothes and sometimes when it's little too much and things really go out of your hand, you realise you don't have enough room to put another new wardrobe. Now that takes me to my third point. 3. You dream of a future where you will have a walk-in wardrobe and it will be no less than a museum with all your possessions safely kept, a place where your clothes, shoes, bags get all the respect they deserve. And if you are lucky, you already have one. 4. Most of your phone's space is taken up by all those online shopping apps and your favourite time pass is browsing them ( even when you don't have enough time and you are supposed to be busy). 5. The delivery guy and the people at the store get to see your face more often than most of your friends. 6. You can look at a person and immediately say what brand they are wearing, the price, it's availability, similar styles, any discount. You are practically the wikipedia when it comes to describing an outfit. 7. Your inbox is always crammed with messages from various stores with offers and discounts. There is hardly any store where you don't have a membership card or ID. 8. Any party or occasion is just another opportunity for you to shop more. You won't even have a look at what you already got and you'll be on your way to get new stuff. 9. You fantasise yourself in different outfits more than you fantasise anything else. 10. Your friends are always asking you to join them when they are going for shopping because you can help them the best but then you end up shopping a lot more than your friend did. 11. You promise yourself than you'll be more responsible (out of guilt) every time you are extravagant and make a pledge not to shop at least for a month only the end up shopping 5 times more after one month. 12. You often hear your family jokingly (hopefully) saying if there was a rehab for shopping de-addiction they would send you there. And the list goes on....But whatever it is, shopping is an amazing experience. It can make you happy, it can heal..and most importantly it can make you feel complete. So if you agree do let me know. But whatever it is boho looks are something nobody can ignore. So once again I was in my zombie zone for weeks. Not going out anywhere,always in my bed eating ice cream, watching series and online shopping of course. But then trust me I have been trying to dress up and at least take pictures for the blog but damn!! I am so lazy. But today I finally did it. Yayy!! And it feels good to see yourself look like a civilized human being in front of the mirror once in a while. Really!! 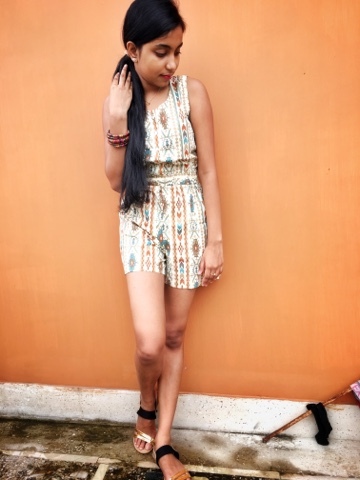 So as usual I didn't have any clue what should I wear and stood in front of my wardrobe staring blanking at it for a while when I saw this aztec romper I got 2 years back. I wore it twice that year and then completely forgot about it. Only after I wore it today I realized how much I love it. 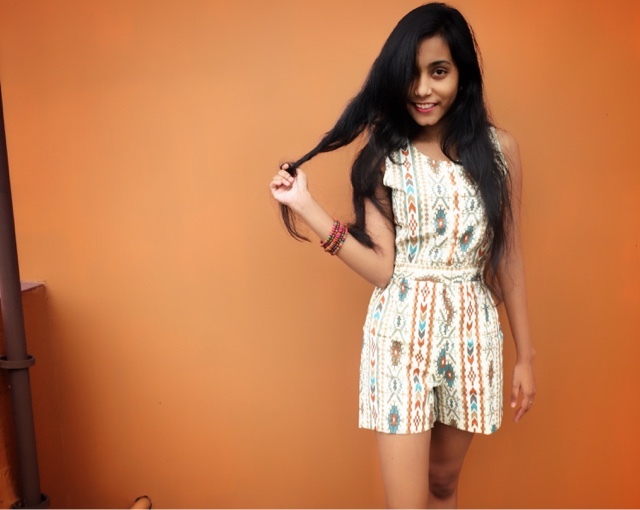 Rompers are perfect for any occasions when comfort is concerned. And aztec print just adds to the boho vibe. I paired it up with the gold toned sandals and the colorful bead bracelet. Now this bracelet was gifted to me by my best friend when we were in seventh grade and ever since then I almost wear it with everything possible (lucky charm I guess) and surprisingly it goes well with everything too. I wore a gold neckpiece and tied my hair on one side.